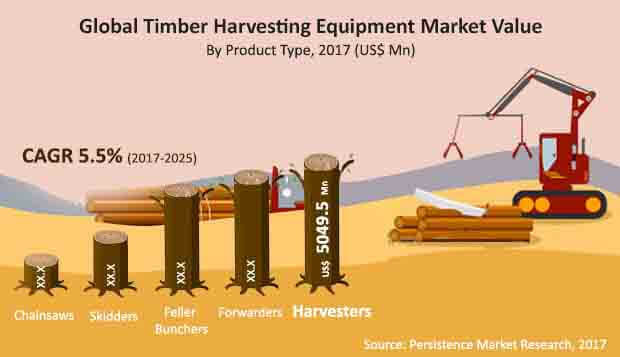 Persistence Market Research has come up with a new report “Timber Harvesting Equipment Market: Global Industry Analysis 2012-2016 and Forecast 2017–2025,” which tracks the performance of the global timber harvesting equipment market for the projected period of eight years. To present a crystal clear picture of the market to our clients, the analysts went the extra mile to give detailed information about the market size, forecast, drivers, restraints, trends and opportunities in all the five regions that have been covered in this report. Apart from regional insights, we have also given comprehensive information on various segments and its sub-segments. For the better understanding of the entire market, we have divided the market based on product type, harvesting mode and region. Wheel of Fortune analysis is the unique element of this report. The key part of this report is Persistence Market Research’s analysis and recommendations on the global timber harvesting equipment market. The report takes an overview of the global timber harvesting equipment market. The overview mainly consists of market taxonomy that underlines factors influencing the growth of the global timber harvesting equipment market. The analysts have provided key strategic recommendations for both existing and new players in the market to emerge sustainably profitable. Decline or increase in prices over the forecast period is based on historic market trends; any decline or increase in prices over the forecast period is kept linear across countries. The general market scenario is assumed for timber harvesting equipment sales and driving factors are assumed to develop the market forecast. The report covers the competitive landscape that provides a dashboard view of companies that manufacture and provide services to the global timber harvesting equipment market. The report consists of company profiles of some of the key players and a strategic overview of mergers and acquisitions along with their expansion in regions. Timber harvesting equipment in the present scenario is the commonly used equipment for the purpose of producing logs of timber. These mechanized equipment help in producing cleaner logs right from the tree with less human effort. The market value generated from the sales of timber harvesting equipment is estimated to be valued at more than US$ 17.50 Bn by 2017 end, and is projected to reach more than US$ 25 Bn by the end of 2025, expanding at a CAGR of 5.5% over the forecast period. In terms of value, Europe and North America combined held a market share of more than 70% of the global market in 2016, which can be singled out to be the most attractive regions for the market to grow. The North America market is anticipated to expand at a CAGR of 4.3% over the forecast period with an estimated market value of US$ 5,946.5 Mn by 2017 end that is projected to reach a valuation of US$ 9,231.3 Mn by 2025. Most of the manufacturers are integrating GPS machine control systems in the design of backhoe loaders, feller bunchers, harvesters and forwarders. Installation of machine control systems in their equipment helps improve the efficiency and allows users to work from their office, instead of being physically present on the site. Moreover, by minimizing material wastage and reducing the need for re-work, machine control can help improve the sustainability of the operation. For instance, if laborers use GPS systems for their equipment, it would help them work from a definite distance, without being physically present at the actual site. Growing urbanization will increase the demand for harvesting timber, which ultimately will surge the demand for timber harvesting equipment. Timber harvesting equipment are relatively costly, hence the option is either to lease or rent them. Some of the equipment that can be leased include excavators, backhoe loaders, feller bunchers, harvesters and forwarders. Leasing the equipment gives an opportunity to modify the equipment for the projects, get technical support and high level personal advice. Prominent manufacturers in the timber harvesting equipment market include Deere & Company, Komatsu Ltd., Caterpillar Inc., Ponsse Oyj, Volvo AB, and Husqvarna AB. Most of these key players have well-established presence in the growing markets. However, these players are actively looking for further strengthening their market presence, either by strategic collaborations and production expansion or mergers & acquisitions. Over the recent past, majority of market participants have been observed focusing on timely new product launches and advanced updates of the existing products. This is primarily focused towards gaining a competitive edge in the market. As the timber harvesting equipment market is consolidated, key manufacturers are focusing on innovation of technology to meet the consumer needs. For instance, in October 2017, Logset Oyj launched advanced technology (T-Winch) for harvesting on steep slopes. On the steep slopes, the weight distribution among the eight wheels is uneven; T-Winch is therefore used for greater assistance. The Skidders segment is projected to create a total incremental $ opportunity of nearly US$ 2,300 Mn between 2017 and 2025. The segment is expected to account for a revenue share of close to 20% of the global timber harvesting equipment market. Feller Buncher and Forwarders segments are expected to lose their market share owing to high cost and limitations for specific applications. Chainsaw and Skidders are expected to gain 60 BPS and 190 BPS respectively between the years 2017 and 2025. The Chainsaw segment is expected to grow at a CAGR of 7.0% owing to its advantage such as easy accessibility.